For a fun seasonal variation to the recylced candle article posted yesterday, try making some mini pumpkin candles to decorate for Halloween or Thanksgiving. First prepare your pumpkins or gourds. Cut a wide hole in the top of your pumpkin and pull the top off. Empty the entire contents of the pumpkin including seeds and strings. To prevent a fire hazard, be sure the pumpkin or gourd is completely clean on the inside. From here you can do one of two things. You can place one of your freshly made recycled votives or tea lights into the pumpkin or gourd (you can do this with apples and pears as well). 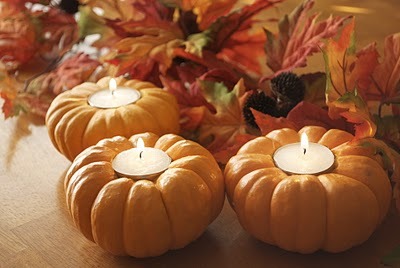 Or you can make the pumpkin or gourd into a candle itself. To do this, melt your scrap candles as explained above. If desired, scent your scraps with a seasonal fragrance, like pumpkin spice. Allow wax to cool to 160 to 180 degrees Fahrenheit. Pour the melted wax into the pumpkin or gourd. Allow the wax to congeal to the sides and then secure a pre-tabbed votive wick into the center of the candle. If the wax shrinks, re-pour a second round of melted wax. Allow to cool completely. Trim the wick and it’s ready to display on your holiday table.